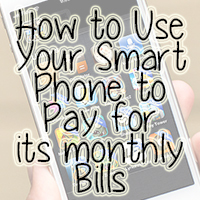 My post on Thursday, ‘How to Use Your Smart Phone to Pay for its Monthly Bills‘ has been very popular! 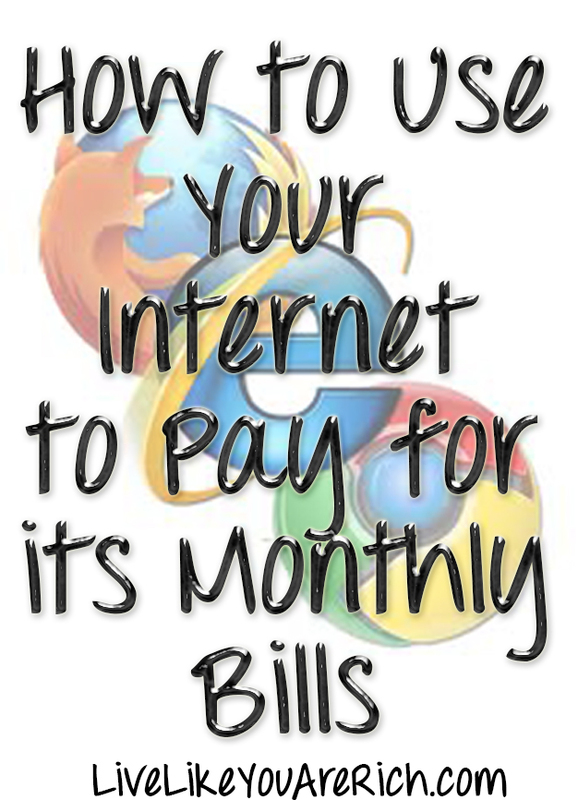 So, I figured I should show my readers: How to Use Your Internet to Pay for its Monthly Bills as well. Most internet bills are around $30-70 a month, averaging about $50.00 a month. There are many ways to make money using the internet. They range from the easy to the intense. This article contains the easiest way of using the internet to pay for itself (at least that I have found). It is geared towards people who are either online 1-2 hours a day AND/OR people who buy groceries. Before you bail off of this webpage when you read the next paragraph just know that this is not your typical internet scheme. This site has been around for over 6 years and has already paid out $45 million in real life rewards. I and many others I know have used this site to make extra money. If you have tried it before you may want to read at least my #1 way to pay for your internet because it is super easy. Further, you may not have known about these big ways to save when you have used the site before. So stick around and read at least the next few paragraphs. The answer to paying for the internet by using it is to Sign up for Swagbucks.com. Swagbucks allows you to earn points/SBs for doing what you may already do online every day- watching videos, searching the web, playing games, participating in market research, shopping online, and …drum roll please… PRINTING COUPONS. Swag Bucks can then be redeemed for valuable rewards, including gift cards to the world’s online and offline retailers (including PayPal and Amazon.com gift cards). Note: If you are not wanting to try Swagbucks there are other ideas of how to use your internet to pay for itself below. #1- The easiest and highest pay out with swag bucks is to print your coupons off through the site. You earn 10 bucks per coupon redeemed. You pay for a good chunk of your internet while saving money on your groceries! Swag Bucks is a free service and Right Now if you click on this link & use the code: ExtraSwag you get a 70 swag buck bonus. Also, if you fill out all of your information you will earn another 30ish bucks which equals 100 Swag Bucks just for signing up. 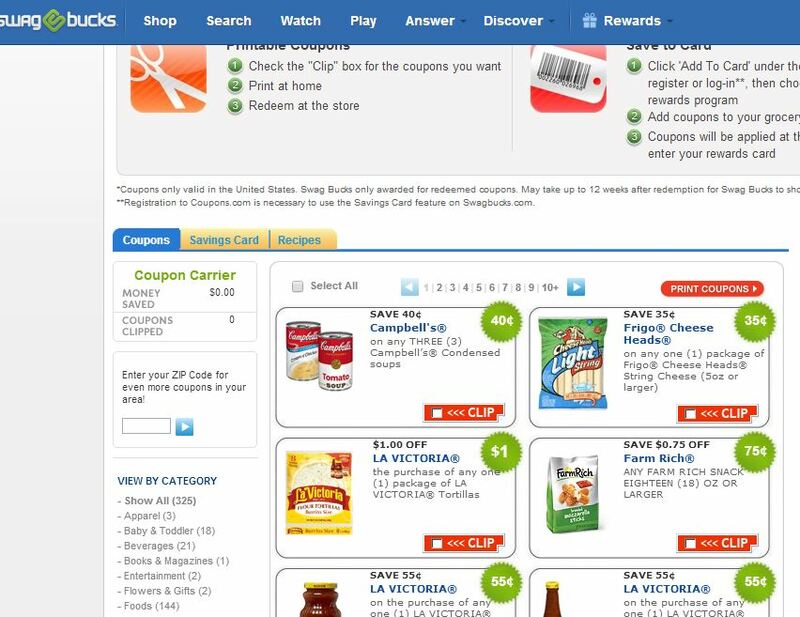 #2-Purchase online items through SwagBucks on Amazon, Groupon, Living Social, Kohls, etc. You receive about 4-10 bucks per dollar spent. If you were to buy an item a month at around $25.00= 150 swag bucks which is pretty cool. (Click on Shop> view stores> then purchase and item> after that you will receive a confirmation email within about 24 hours and the bucks will be added to your account). #3- Watch movie clips or just play them in the background while browsing the internet, paying bills, using social media, etc. There are channels (news, health, media) and popular shows (The Voice) etc. For every 10 video clips you watch you get 3 Swag Bucks. The maximum is 500 videos a day for maximum of 150 Swag Bucks. Although there is absolutely no way I’m watching 500 short videos a day, I can get through 10-40 depending on how long I’m online. What I do is have the videos playing on a separate browser while I check my email, pay bills, browse social media sites, or write blog posts- like this one. I put the volume low enough that I can still hear it going in the back ground so I know when it ends. It is not loud enough to distract me from my tasks. Once I hear it has ended I quickly click on the browser, click the next video, and click back which only takes a few seconds to do and keeps me earning. Just make sure to type in the code when you hit the 10 movie mark so you get your bucks! #4- Search for things you would normally “Google” in the SwagBucks search bar. When you search with SwagBucks you are rewarded about every 3rd or 8th search with bucks. If you surf the internet regularly these bucks really add up. I keep a SwagBucks tab open and instead of going to Google I’ll search what I need in their toolbar. CAUTION: Unless you are completely committed to making a ton of money through SwagBucks I do not recommend downloading the tool bar! It will slow down your browser and the tabs will constantly be searching and refreshing. I uninstalled it within about an hour of installing it because it drove me crazy! So I either recommend not installing it or installing it on a lesser used browser that you do not mainly use for internet browsing. Instead of the tool bar I just keep a SwagBucks tab on my browser or bookmark it. This way when I want to search something I click on it instead of Google. #5- Complete the high-point surveys. Sometimes the lower 1 or 2 point surveys are a joke. I look for the highest points per surveys and try those. The lame thing about the high-point surveys is that I don’t qualify for a lot of them. But the good thing is they do reward you with a point or two for even trying. I would recommend only trying the high value surveys because if you do qualify you will get lots of points and if you don’t qualify you still get a point or two for trying. #6- Play games- If you love scrabble, BeJeweled etc. you can make SwagBucks for playing these games online. #7- There are a couple of easy daily tasks to perform for a few points each. One is to answer a question and the next is to look at a bunch of offers (just be sure to push skip if you don’t want it). These also only take a minute or so and earn a consistent amount of bucks. Other options that do not appeal to me right now, but that are available, are signing up for special promotions and finding codes on certain social media pages such as Facebook to earn bucks. Whatever you decide to do to earn points just keep with it and they will really add up. There are people who pay for their entire Christmas with Swagbucks. As you can see there are a variety of ways to make SBs. I just stick to the most efficient, which are printing my coupons, buying through SwagBucks, running the video clips while I’m browsing, and sometimes taking their high value surveys. I also do the daily poll because it is pretty interesting. Swag Bucks is a free service and Right Now if you click on this link & use the code: ExtraSwag you get a 70 swag buck bonus. Sell things that you do not need in your home on online classifieds, craigslist, Amazon.com Ebay etc. This is actually easier than using Swagbucks but the reason it is not number one is because it is not a consistent thing for everyone. Once you sell your items and run out of things to sell the income stops. If you decide to make a little side business of it by buying low and selling higher like I do (more tutorials coming on this), it can be a great way to increase income. Here is the first article I have written on how to sell online. Money-Making Stay at Home Moms where I highlight and interview over 20 SAHM’s who all make money in different ways from home! For other ‘rich living’ and money saving tips subscribe, like me on Facebook, and follow me on Pinterest. p.s. I did not include Swag Bucks in the article about getting your phone to pay for itself because 1- you can’t print coupons from your phone (at least not from the site Swag Bucks supports) and 2- most people no longer have unlimited data and Swag Bucks would take up too much data in your plan watching shows, taking surveys etc. Thank you so much for the tips on swagbucks. I use the site, but had no idea of how many other ways I could be making cash on there! Really liked this article and learned something about swagbucks I didn’t already know. Can you recommend where to get started on that? I can never find legit work from home companies. Joanna- Please follow this Money-Making Stay at Home Mom series. You will be able to read about transcriptionists and online data entry jobs as soon as I get those series posted. I tried the ExtraBucks code and it didn’t work. They did email me and tell me the code is ExtraSwag. Thanks for commenting on this. They did add the bonus points to your account. The ExtraBucks code didn’t work for me either :/ I tried it with and without caps, is it still valid? Kat I will email your email to SwagBucks and they will apply the bonus points. Sorry for the difficulty. It works for most people… I’ll have them double check the code though. Kat, There was an issue so thanks for emailing. The code is ExtraSwag and I will email them and ask them to add the bonus points to your account! You have to be 13 or older to use this site, so make sure to put an appropriate year in the field. I’ve been trying not to use too much of my personal info online, so just clicked a random year, and it shut down my account, but they’re fixing that for me now! lol That’s what I get I guess. Anyway just thought you should know that. And I got close to 140 SB for the code ExtraSwag, maybe they’ve increased it! Can’t wait to really start using this site! Thanks for the info. Thanks for the heads up. I’m glad you got more bucks for using the code! Affiliate links may be used in this post. Printing a coupon or ordering a product through this link may result in a commission, which helps pay for the cost of running this site and keeps the content free. Read my full disclosure policy here.